Cooper Webb is a legitimate madman. I watched all day last Saturday waiting for someone to attempt that double out of the corner before mechanic’s hill. Many times, I’d catch a rider going wide in the corner before only to scrub it and single/single. Not Coop. With only a lap and a half remaining in the second moto, the #17 uncorked it and set sail. And, man, did he come up short. That just shows you how angry he was with Marvin Musquin and how determined he was to either make the pass or just punt him into tomorrow. And could you really blame him? Musquin was a swerving Irvin (old NASCAR term) those two laps mid-moto. The championship contender chopped Webb off pretty much every jump. I get it that he’s leading and it’s his track, but there were some questionable cross lines, and clearly Webb didn’t appreciate it, especially after what happened at Washougal. I just love watching that kid ride and seeing all the passion he puts into it every lap. He’s the original Beast from the East, Damon Bradshaw, reincarnated. What’s in the water down there in North Carolina? Let’s get into some Revolver. I just didn’t feel it anymore. I love being a fan, but I had genuinely lost the spark for riding. My last year of racing full-time arenacross was 2002. In 2006, I got the wild hair to go race the old-man classes at Loretta’s. I had a great time that year. No pressure—just going out racing and having fun. In 2007, I decided to take it more seriously. Down deep I didn’t like getting beat by my old race friends, Mike Treadwell, Keith Johnson, and John Grewe. So I practiced with more intensity during the week. My buddy KOG got my Storm Lake Honda 450 all modified, so it was a beast. And you know what? It took all the fun out of it, and I actually raced worse. We drove back from Loretta’s that summer, I dropped off my bike to Jeff Schultz at Storm Lake, thanked him, and didn’t touch a bike again until 2012 when Racer X asked me to participate in the 2013 Kawasaki KX250F bike launch at Millville. Now, mind you, I hadn’t raced in eight years, and I hadn’t raced or ridden a two-stroke since 2002, thirteen years ago. But I was all in. Stan asked if I wanted to go practice and ride the bike before. I said, “No, I’m good, I’ll see you Saturday.” Friday rolled around and I might have had a slight panic attack. So after work, I headed to the pool to relax and get my head straight. Well, happy hour with the neighbors ran much later than anticipated, and I didn’t even wake up in my own bed. I guess the pasta carbo-loading the night before was shot. It was the 1990s all over again. Luckily, I had a couple hours until practice to try and work off a brutal hangover. I quickly realized that I needed to slow down, that I wasn’t supposed to keep pace with those guys. I jumped in my truck and made the trek over into Iowa. The boys had built one hell of a compound in the back of the pits, and there sat my ride for the day. Stan had her all prepped and ready; all I had to do was show up and race it. It truly was like the nineties. We hit sign-up with the plan of racing one class. 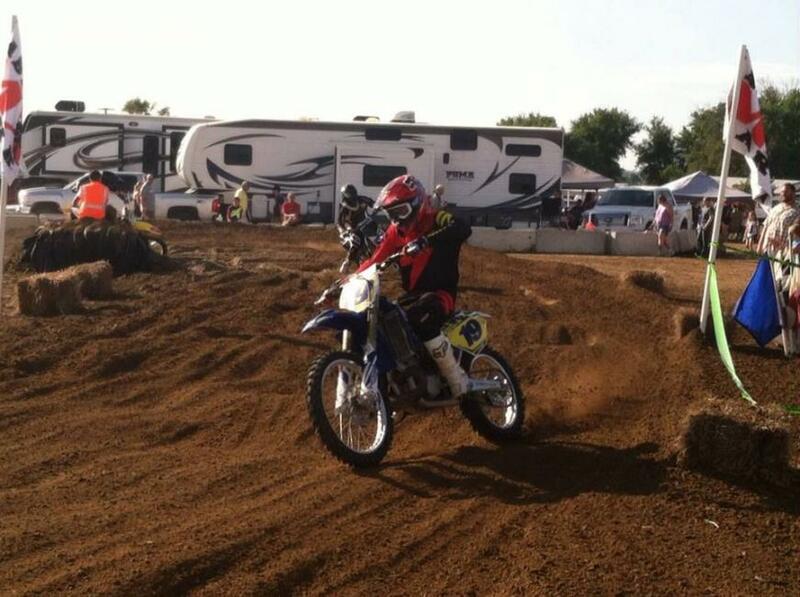 If I did practice and two motos, I could say I raced. While signing up, Stan noticed that plus-40 wasn’t a money class, but plus-35 and -45 were. In a moment of haste, I sign up for all three classes—practice and six motos. My body began to ache at the thought, and practice hadn’t even started. I got geared up, jumped on the bike, and set the sag—that’s really all we did. The bike felt perfect; the bars, levers, and pedals were all spot on. I fired it up and, man, did I miss the braap of a 250 two-smoker. About thirty minutes later, I headed out for second practice. Much better. Some of the rust was knocked off. Third practice rolled around and the old me was back. I think I sweated off the hangover in the first practice and was then jumping everything and blitzing the whoops. The bike felt perfect. Stan the man knows how to set up a bike like ol Don, my dad, used to for me. My first race of the afternoon was combined—Plus-25, -30, and -35. I got the chance to line up with my friends Gilmore and Delozier. I’ve known Cody since he was a little kid racing Cobras, but in all our years we never got to line up next to each other. It is a great feeling hanging out and racing with your buddies. Gate dropped. Mind you, I had completely spaced on practicing any starts, but I came out third behind Cody and Nic, and set chase. It’s funny how your old race mind immediately takes over. In my mind, I was going to try and keep pace with these two. I hit one of the jumps sideways in lap two, cleared a hay bale, and landed sideways in the infield. I saved it and eventually finished third. I quickly realized that I needed to slow down, that I wasn’t supposed to keep pace with those guys. The rest of the afternoon and night couldn’t have gone any better. I ended up pulling some holeshots and winning three of six motos. But some of the best parts were seeing old race friends I had grown up with and participating in the usual bench-racing back in the pits between motos. However, the absolute best was being able to race in front of my son. 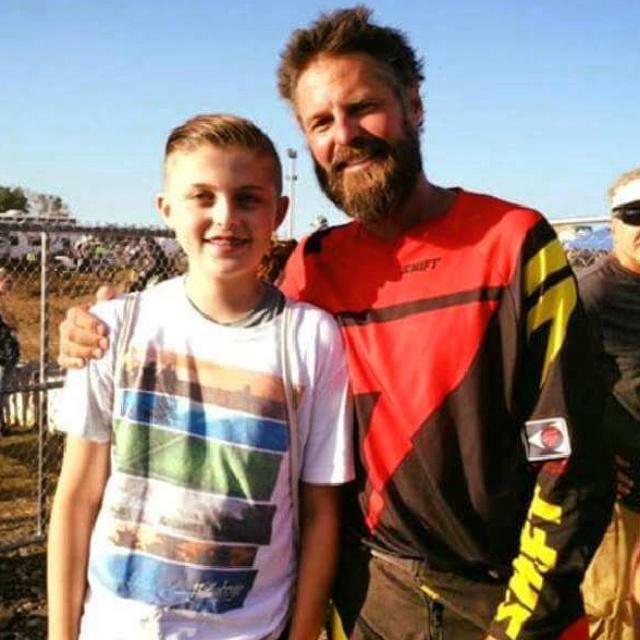 Riley had seen me race a few times when he was really little, but now he’s 13, and having him come out and watch old pops knock the rust off and win a couple races definitely made us both smile. His mom told me later that night that he couldn’t stop talking about it. It’s a good feeling when you can make your boy proud. After the races we all loaded up and partied till morning. We were going to keep this nineties theme going till it killed us. Come Monday I could barely move, but it was well worth the pain. One and done I say, but once a motocrosser always a motocrosser for life. It’s in our DNA. I’m a dirt biker.